I’ve now finished our giant Summer picture. This picture is something we’ve been doing for the last year, creating a large picture on the wall based on the current season. We started this one at the beginning of the summer, but we have just added the final finishing touches after our holiday to the seaside in Devon (see later). The photos not great. It’s the biggest picture that I’ve done and it was very difficult to get a good shot. We have a staircase banister that prevents me getting the whole picture in the frame [excuse to buy a new lens I think 🙂 ]. This photo was taken at a very steep angle and hard to be distorted to get it to fit into a rectangular shape. The actual picture looks better than the photo. In the past it’s just been my daughter and I that have created the picture, but this time it involved the whole family in some way. It even had a bit of help from my children’s nursery. The background is created using rolls of craft paper see Spring Picture for more details. I used a pencil to draw the outline of the sandcastle on orange paper and then got my two children to paint one each to give it more of a sand look. My youngest is only one, but loved using his fingers to add the paint. I then added a pen outline and cut them out. 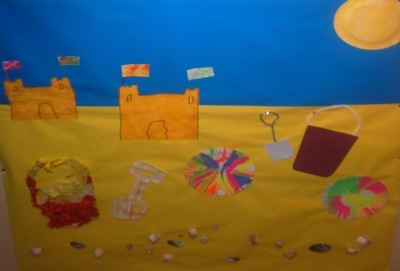 The flags were made using magic blo-pens using the colour changing pen to add the multi-colour effect. The flag poles are craft giant matchsticks bought at Wilkinsons. beach balls were also made at nursery (I’m not sure whether they were intended as beach balls or just painting, but they worked well either way). My wife and daughter made the sun using a paper plate and yellow glitter paint. Finally the shells were collected from the beach whilst on holiday. These were all glued on to the background paper using a hot melt glue gun. The glue gun was particularly useful for glueing the shells and the pipe-cleaners to the picture which would have been very difficult with PVA glue. Then it was done. In all there was a few hours work, but this was spread over a few weeks (especially with waiting to collect the shells). Why not reserve a piece of wall in your own house? It’s good fun, educational and looks good. It’s visible to all visitors to our house and is a great way to show off your child’s craft work. You don’t even need to be particularly artistic – as I have proven. Other links of activities with babies and young children. This entry was posted on Sunday, August 2nd, 2009 and is filed under Babies, Children, Crafts, General. You can follow any responses to this entry through the RSS 2.0 feed. Both comments and pings are currently closed.